This learning video deals with a question of geometrical probability. A key idea presented is the fact that a linear equation in three dimensions produces a plane. The video focuses on random triangles that are defined by their three respective angles. These angles are chosen randomly subject to a constraint that they must sum to 180 degrees. One class period is required to complete this learning video, and the only prerequisites are a familiarity with geometry and an understanding of the equation for a plane, which is presented in the module. Materials needed for this lesson include blackboard and chalk. Optional materials include a cardboard box and colored paper. An example of the types of in-class activities for between segments of the video is: Ask six students for numbers and make those numbers the coordinates x,y of three points. Then have the class try to figure out how to decide if the triangle with those corners is acute or obtuse. 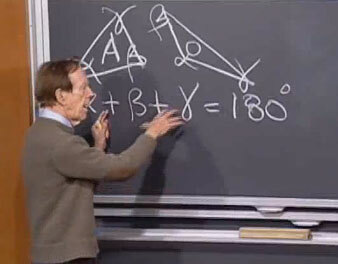 Professor Strang teaches Linear Algebra and Computational Science at MIT, and both of these classes are videotaped and available on MIT's OpenCourseWare ocw.mit.edu. He also writes research papers and textbooks on these subjects. Click here to read more about Professor Strang.